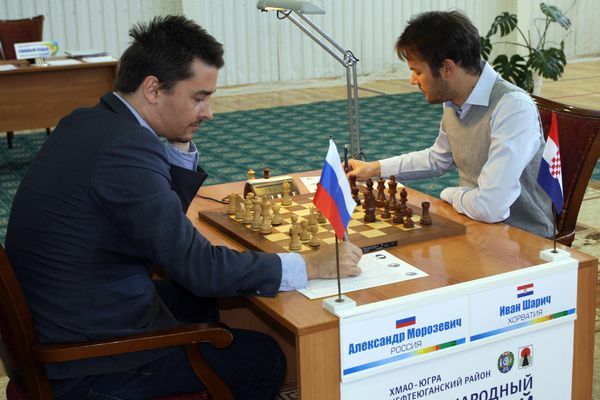 In Round 5 of the Karpov Tournament in Poikovsky runaway leaders Alexander Morozevich and Ivan Saric played out a fiercely contested draw. chess24’s Jan Gustafsson takes a look at that game while also examining the progress of the double-headed monster Morosaric, which has dominated the field so far. 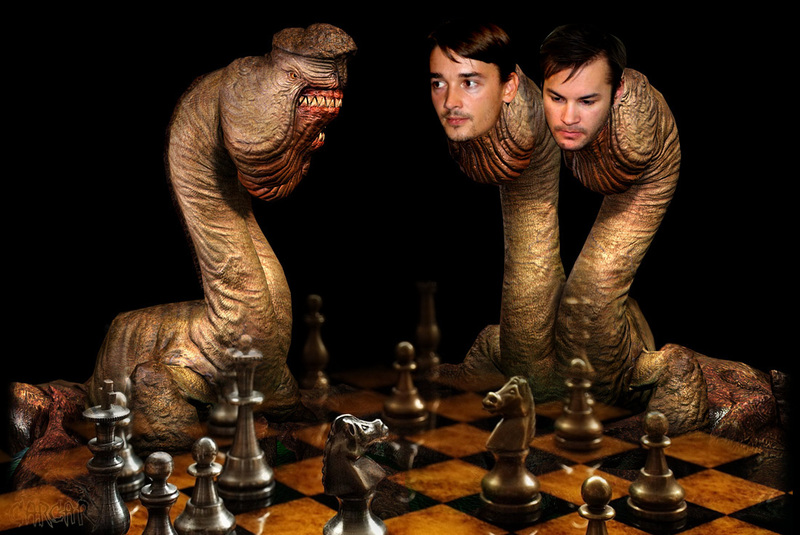 Alexander Morozevich is an eternal enigma. A member of the world elite for 15 years he’s currently “only” on 2719 and ranked 30 in the world. His rating swings wildly up and down in the 2700-2800 range, while his activity instead oscillates between “low” and “very low”. That may partly be because he hasn’t always enjoyed the best reputation among tournament organisers after pulling out of numerous events at the last moment. Later on as well he thought about quitting and in 2011 he declared his professional career had come to an end: “The end of my active professional career essentially came in January 2010”, cites Chess in Translation. Things are definitely going his way in Poikovsky. A technical win against Bologan was followed up by another full point against the reigning European Champion Alexander Motylev, who couldn’t withstand the pressure. For a long time against Alexei Shirov he looked on course for a hat-trick, but the Latvian defended tenaciously and escaped with a draw. Morozevich didn’t let up, however, and picked up win number 3 in a wild game where his opponent Emil Sutovsky let a good opportunity slip. 22. ♕e4! and due to the powerful threat of Qe5 Black is suddenly on the edge of the abyss. His only chances lie in the complications after 22... ♘b4! (22... ♗c6 23. ♕e5! f6 ) 23. ♕xb7 ♘xc2 24. ♗c3 ♘xa3 Despite the extra piece White must still be very careful, but in the long term he should have the upper hand. 25. ♕xd7 ♘b5 26. ♖g3 With an edge. 22... ♘xf4 23. ♕e3 ♘g6 The position remains complicated but White's best chance has gone. The only man to keep pace with Morozevich has been Ivan Saric. The 23-year-old Croat is, by comparison, a relatively unknown quantity. He was the U18 World Youth Champion in 2008 and his rating crossed 2600 at the start of 2010. After that things went quiet for a while, but 2014 looks like being his year! First he won the Challengers Group in Wijk aan Zee, which is not only a strong tournament in itself but also guarantees him promotion to the A tournament and an encounter with the world’s best next year. His success brought him an invitation to Poikovsky as the ACP wild card nomination. Curiously, he’s not the only representative of the ACP at the tournament. Its president, Israeli Emil Sutovsky, is also taking part and has fallen victim not only to Morozevich but also Saric. He also pulled off two clean victories with White against 2700ers Nepomniachtchi and Eljanov. You don’t need to be a prophet to predict that Saric himself will soon join their ranks. Let’s take a look at the clash of the leaders – would the double-headed monster remain stuck together at the top? 1. e4 Like most stars of the scene Morozevich plays both e4 and d4. 1... e5 Saric is a classical player and usually prefers this excellent move to 1...c5. 3... ♘f6 is also part of the Croatian's repertoire. It's interesting that he avoids it against Morozevich, who doesn't have such a great reputation for knocking down walls. 5. 0-0 ♗e7 6. d3 when Black has already decided his bishop's place is on e7. 6... ♗c5 As White has already played d3 the annoying c3-d4 push is only possible at the loss of a tempo. 7. a4 Morozevich holds off castling and forces Black to take a typically uncomfortable decision for this position - how should the queenside be held together? 7... b4 The lesser evil. 7... ♗b7 is in my view even a typical error, as the bishop on b7 has no great future against White's d3-e4 block. 8. ♘bd2 0-0 9. ♘c4 The drawback of the move b4 is that White now has this square at his disposal, but experience has nevertheless shown that it's a small price to pay. In the following moves Saric follows the typical setup. 9... d6 10. h3 h6 Securing the bishop a safe spot on e6. 11. a5 Again a typical move. White isolates the b4 and a6-pawns from each other and secures the a4-square for a rook or bishop. On the other hand the a5-pawn can also become weak and Black gets the b5-square for his troops. 11... ♗e6 12. 0-0 ♖b8 13. ♗e3 ♕c8! This might look strange, but it's normal: the queen covers a6 and makes space on d8 for the rook, which in turn makes way for the bishop to go to f8. The e8-square is less inviting for the rook as Ba4 can always cause trouble. 16... d5 Black has completed his setup and now becomes active in the centre. Saric has handled the opening well and managed to equalise. 17. exd5 ♗xd5 18. ♗a4 ♕e6 The preceding manoeuvres pay off as all the black pieces find sensible posts. 19. ♖e1 ♘e7 The regrouping of the knight from c6 to g6 also looks harmonious, but for half a move Black loses sight of the c5-square. 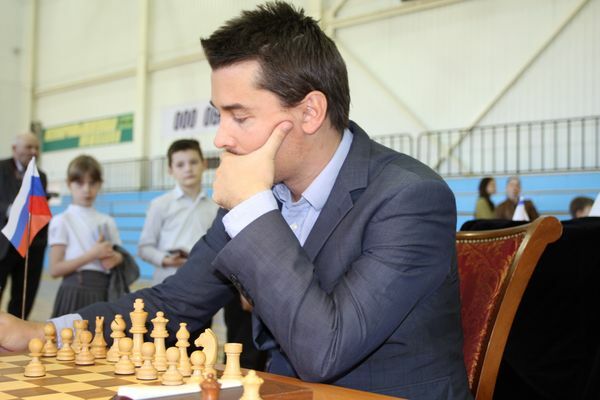 Morozevich lets his chance slip. 20. ♗c5! ♘g6 21. ♗xf8 ♖xf8 22. f3 and suddenly due to the e5-weakness Black's position is no longer so simple. 20... ♘g6 21. f3 ♘d7 Everything is once again securely covered and Saric sends his next knight on a journey, threatening Nc5. 22... ♘c5 23. ♗c2 ♕c6 24. ♗f2 b3⁉ Rejecting opening the b-file but locking the white pieces in their own camp, at least temporarily. 25. ♗b1 ♖e8 26. ♘e3 ♘f4 The manoeuvring struggle has given White no advantage at all and in fact he has to be on his guard. Morozevich now decides to alter the character of the game, mainly in order to open up some options for the b1-bishop. However, the black pieces are well-prepared for a direct confrontation. 27. ♗g3 preserves the status quo. 27... exd4 28. cxd4 ♘ce6 d4 is weak and not only the b1-bishop but also the f8-bishop now has a beautiful diagonal - the beautiful b4-square beckons. 29. g3 ♗b4! There it is! 30... ♘xd5 31. ♖c1 Also forced. 32... ♘g5? Undoing all the fine work up to this point. 32... f5! 33. ♘c5 ♗xc5 34. dxc5 and now 34... ♘g5! when White is wandering on the edge of the abyss. 33. ♘xg5 hxg5 34. ♗e4 It's once again roughly equal. 36. ♖a3 attacks b3 and prepares Rca1. 37. ♕e2 ♘b4 38. ♕c4 ♗b6 Saric proves he has no fear of great names and rejects the offer of a repetition of moves. 39... ♗xd4 40. ♗xd4 ♕xd4 41. ♖d1 ♘c6! 42. ♖xd4 ♖xb3 43. ♖xd8+ ♘xd8 44. ♖xa6 ♖xb2+ After the latest transformation we've got an ending on the board where the extra pawn means only Black can win, although due to the reduced material, the weak c7 and the active white pieces the drawing chances are totally intact. 46... c5 47. ♖a5 ♘e6 48. ♗d5 ♖c2 49. ♗xe6 fxe6 50. ♖a7 leads to the position in the game. 47. ♗d5 ♖c2 48. ♗xe6 fxe6 49. ♖a5 c5 50. ♖a7 Black has managed to hold onto his extra pawn and can continue to seek winning chances, although due to his weak kingside and passive king they shouldn't be crowned with success. 52. g4 seems simple, and then after something like 52... ♔e8 53. ♔e1 ♔d8 54. ♖c5 ♖h2 55. ♖xc3 it's a draw. 55. ♖c7 ♖h2+ 56. ♔g3 ♖d2 57. ♔g4 ♖d5 58. ♖b7 ♖f5 59. ♖a7 ♖f4+ 60. ♔g3 ♖f7 61. ♖a5 ♖f5 62. ♖a7 ♔g8 63. ♖e7 ♖e5 64. ♔g4 ♖e3 65. ♖a7 ♔h7 66. ♖a5 ♔h6 67. ♖xg5 ♖xf3 68. ♖xg7! ♖f1 69. ♖e7 ♖f6 70. ♖a7 ♔g6 71. ♖e7 ♔h6 and Saric abandoned his winning attempts. The lead remains shared but it was crystal clear that Saric was closer to a win and controlled the game. He's arrived! Only Jakovenko is within touching distance of the lead duo after pouring more misery on Sutovsky in Round 5. The other two decisive games – Nepomniachtchi 0-1 Motylev and Eljanov 0-1 Bologan – merely mixed up the standings towards the bottom of the table.